Running at Blue Caterpillar Gallery in Pietermaritzburg are exhibitions of work by Nicola Crawford and Dianne van Wyk. Nicola Crawford is a local Pietermaritzburg artist and her paintings are contemporary and yet contain a ‘vintage’ flair in some of her subject matter. Work on show until the middle of November 2017. 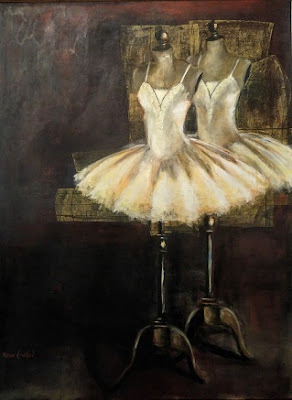 Using muted tones of greys, blue and beige her paintings are soft and feminine – sometimes she uses a strong or dark background colour to emphasize the subject matter itself. Dianne van Wyk is a Durban based artist with a love for print making, nature and artwork that ignites the imagination. Her paintings have a unique texture and her use of colour and light are inspiring. The gallery has a current display of her work and will continue to add new pieces. The Blue Caterpillar Gallery is situated at the Butterflies for Africa complex at 37 Willowton Road in Pietermaritzburg. Gallery hours are Tuesday to Friday from 09h00 to 16h30, Saturdays 09h30 to 15h30 and Sundays 10h30 to 15h30.